Foot Bunions Procedures – Bunions occur when the big toe deviates from its normal alignment. With the most common problem, called “hallux valgus”, the big toe deviates towards the other toes. This disrupts the joint, and arthritic changes sometimes develop in the joint. The prominent bone at the side of the big toe compresses the skin against the shoe, and a sac of fluid called bursa may form in the tissues. 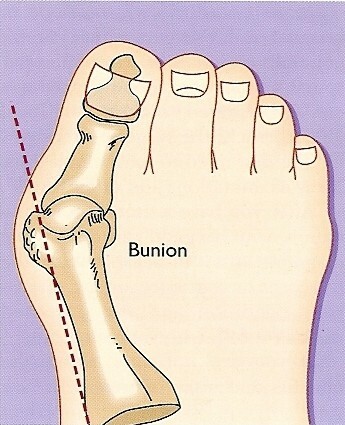 This swelling of soft tissue, bursa and underlying bone is called the bunion. It can be very painful. As the big toes joint has moved, it crowds the second toe so that it is bent upwards, usually resembling a claw. The deformity of the second toe is called a hammer toe. This often causes a corn on top of the toe due to pressure from the shoe. Hallux valgus tends to run in families and is more common in women. Shoes with a narrow pointed toe box and high heeled shoes contribute to the problem, according to some experts.After surgery, the foot has to heal for several weeks (at least) before the patient can walk easily and wear shoes comfortable.Persistent pain is the key reason for surgery. Operating on painless bunions so the toe looks better can give disappointing results. This is called orthopaedic cosmetic surgery.